Your hair is one of your most beloved and treasured assets. Therefore, when it starts to thin or disappear, the damage rarely stops at the loss of hair. If your self-confidence is waning because you’re losing your hair, you do have options. At Aesthetic & Dermatology Center, we have the right hair loss treatment for you. Here, we understand how important it is for you to look good and feel good. Your board-certified dermatologist will work closely with you to determine the type of hair loss that you have and develop a personalized treatment plan geared toward meeting your cosmetic and overall wellness goals. There are numerous types of hair loss, and after your board-certified dermatologist determines what type of hair loss you have, you will receive an individualized treatment plan tailored to the specific type of hair loss you are experiencing. Often, hair loss is genetic; however, environmental factors can play a major role. Androgenetic Alopecia: This is the most common type of hair loss. It only affects the hair on your head and is genetic, as the name suggests. Both men and women can experience androgenetic alopecia, but it is more common for men. Stress Induced (telogen effluvium): Stress changes our bodies, which means that it can also induce hair loss. Stressful events that can trigger hair loss are childbirth, grief, sudden weight change, or illness. Spot Baldness (alopecia areata): Alopecia areata is an autoimmune disorder that causes people to lose hair in specific spots. 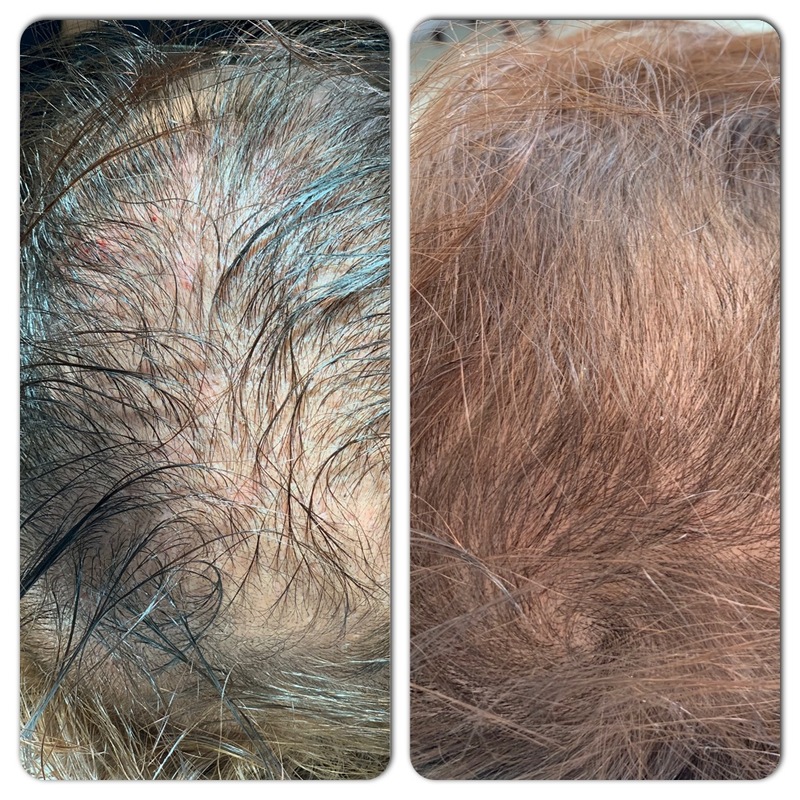 Rarely will a patient lose all of their hair from alopecia areata. Aging Alopecia: As we age, our hair thickness and volume changes as the growth cycle decreases. As a result, hair appears thinner. Traction Alopecia: As your hair is pulled in one direction for long periods of time, your hairline may begin to recede. Generally, this can be seen in people who frequently wear ponytails, helmets, or head gear that puts prolonged stress on the hair. Fungal Infections: Sometimes, infections can cause itchy, scaly scalps that can lead to hair loss. The type of treatment that you will receive will be indicated after your board-certified dermatologist at Aesthetic & Dermatology Center determines the type of hair loss that you are experiencing. We offer treatments such as medications, topical treatments, and PRP. After a consultation with your board-certified dermatologist, Dr. Green will develop a personalized treatment plan that is designed to help you reach your cosmetic goals. 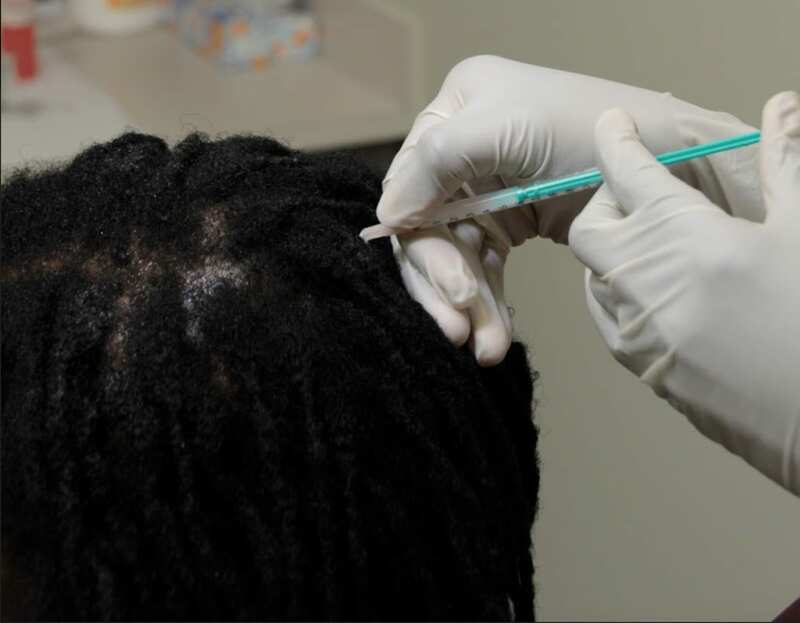 At Aesthetic & Dermatology Center, we stand behind everything that we do, and that’s why we offer or patients platelet-rich plasma (PRP) therapy for hair loss. PRP is concentrated blood plasma containing up to 5 times more platelets found in circulating blood. Because PRP contains growth factors and bioactive proteins known to stimulate the body’s natural growth factors, PRP treatment has been successfully utilized in other medical specialties, such as orthopaedics and plastic surgery. PRP is also thought to aid in hair growth in patients who are experiencing male and female pattern hair loss. Your blood will be drawn and prepared during your appointment. The PRP treatments begin by taking a small sample of your own blood that your dermatologist will spin in a centrifuge to separate the red blood cells, and plasma from the platelet-rich plasma. PRP releases natural growth factors and amplify the body’s natural healing process. This solution is then injected directly into the scalp at the hair thinning site(s). The PRP then stimulates your body’s growth response to produce an increase in hair count and density. If you haven’t responded to conventional hair loss treatments or want to know more about what will work for you, call our office today at (301) 610-0663 or schedule your consultation online with Aesthetic & Dermatology Center!